Does anyone know the outcome of Education Swanage's meeting with the government last 10 August???? There is nothing up on its website and my enquiries are not being answered. The idea of a couple of dozen random and self-selecting and unelected citizens being able to take control of planning looks pretty scary to me. You notice the word "or" in my quote. You can set up in opposition to the parish council and there does not seem to be anything to stop a determined developer setting up a group if they can persuade 21 noddies to join it and writng their own neighbourhood plan for their patch of the town. On the other hand it looks like the residents of a conservation area could put themselves in a better position to safeguard the area against unsympathetic changes, an area in which it must be said PDC have been more than a little lacking. A problem we have discussed on here in the past. Let's all get together and support the attempt by the Hospitality Association to bring the Mowlem Theatre into the mainstream of Swanage's thriving live music scene! On Saturday, 27 August 2011 at 7.30pm there will be three bands - well worth your money. Click on 'Mowlem Live Music' above to go to the Mowlem website. 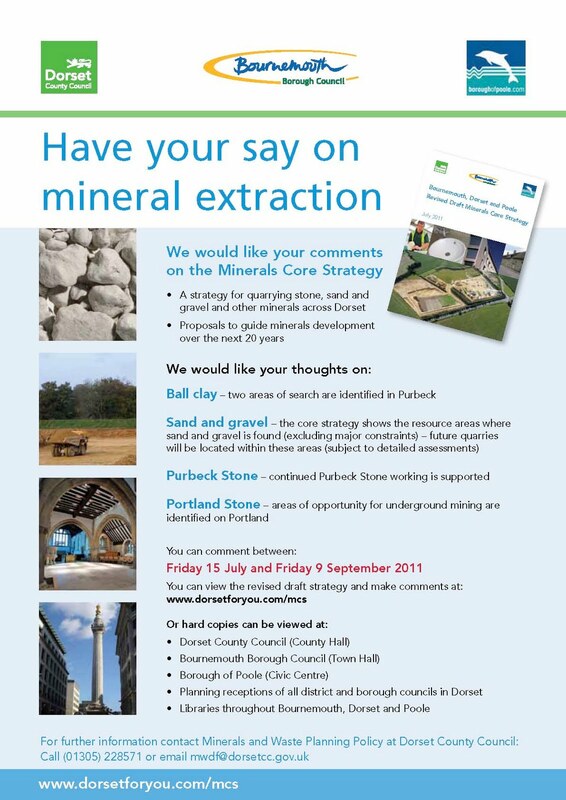 Dorset County Council, Bournemouth Borough Council and the Borough of Poole are inviting your comments on the future strategy for quarrying sand and gravel, building stone and other minerals. We tend to take minerals for granted – yet materials sourced from quarries are around us every moment of every day. The Bournemouth, Dorset and Poole Minerals Core Strategy aims to ensure the supply of minerals in environmentally acceptable ways. Purbeck Stone is a mineral of national importance found locally, occurring west of Swanage to Worth Matravers. Many villages in Purbeck are characterised by buildings made of the stone and it has also been used in the architectural detailing of a number of cathedrals in England. The minerals strategy supports further stone working and considers the appropriate scale of workings within the distinctive limestone landscape of the area. People are asked if they agree with the approach in the minerals strategy. Additionally, important resources of ball clay, used in the ceramics industry, are also found in Purbeck. The strategy identifies two future areas for future extraction, one north-west of Wareham and one west of Stoborough, in order to direct working to the least sensitive areas. The Minerals Core Strategy also sets out the approach for dealing with other minerals and policies to manage quarry development and restoration. 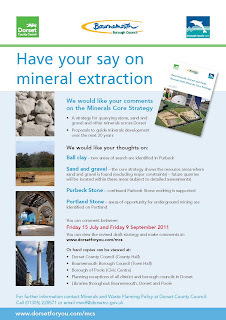 The strategy for minerals extraction is available to comment on until 9 September 2011. For further information go to www.dorsetforyou.com/mcs or call Dorset County Council’s minerals and waste planning team on (01305) 228571. Does anyone have comments on mobile phone coverage in Purbeck/South Dorset between the big 3 providers, Vodafone, Orange, 02. I understand some people have problems with 02 at certain times as their network tends to get overloaded. Any info gratefully accepted. Thank you. Article from the Avertiser page 4 August 18, 2011 by George Willy. RAW SEWAGE ON THE BEACH. Wessex Water has launched an investigation into what is delicately described as ' sewage solids ' that escaped onto the privately-owned beach at Ocean Bay following recent intense rainfalls. So anyway being a member of Surfers Against Sewage and I am hoping soon to be a representative for the them for Swanage and Durlston bay. I find this appalling and upsetting not just for myself and my family , but for the many people who use our beach. This is SAS’s core campaign protecting the health of recreational water users from sewage polluted water. Scientific studies have consistently highlighted that those using beaches, lakes or rivers for sports are most at risk of falling sick from an illness associated with sewage polluted water. In some cases this risk is 3 times greater than your typical bather because sports like surfing involve more immersion and ingestion of water. Despite SAS’s success at virtually eliminating continuous sewage outfalls there are some notable brown spots’ across the country where raw sewage is still discharged on a daily basis and these areas are subject to current SAS campaigning. The main examples of this are in Brighton, Guernsey, The Thames and Northern Ireland. We are also seeking improvements to the combined sewer overflow (CSOs) systems that pollute recreational waters all too frequently, usually after heavy rainfall. The way water companies plan their investment programmes also requires major attention. Much of the current investment has ignored or disregarded the impacts of climate change, in particular changing weather patterns that will result in increased flows of water into and out of the sewage works without treatment because there is not enough capacity to store the sewage. It is therefore discharged through CSO’s. More pollution incidents are expected because of this and that means more time out of the water for the likes of YOU and US! I hope this is sorted out soon and make everyone feel safe to use our beach. As you can see, Dorset is to receive 9.4 million to help with updating broadband services. Unfortunately, allocations will be left in charge of local councils, and thus if they don't know what to do with the money, it'll be left unspent. However, it looks like local businesses and residents will have a say too, so there is hope here. So, come on Dorset county Council - now is your chance. The money is there for the taking and the government want to assist rural areas - there should be no excuses anymore. Some of the people commenting on here are being nasty, petty and abusive of others in the expression of their opinions. In future any comments containing such attitudes will be deleted in their entirety.